In Zechariah 4, we learned about two anointed ones who would stand before the Lord of the whole earth. These two anointed ones drank of the Spirit of Christ, “not by power, nor by might, but by My Spirit” (Zechariah 4:6), translated as “by My Word” in the Targum. These were described as “two olive branches that drip into the receptacles” (Zechariah 4:11). The Spirit of Christ was the Rock that hit the Statue of the beast, in Daniel 2:45, using these two anointed ones. Daniel described these two anointed ones in Daniel 12:11, “from the time that the daily sacrifice is taken away, and the abomination of desolation is set up, there shall be 1,290 days. Blessed is he who waits, and comes to the 1,335 days.” See notes at Daniel 12:5-13. 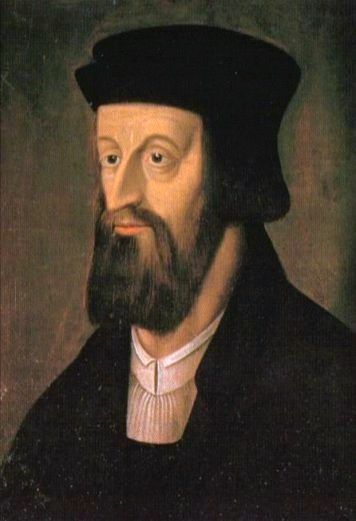 The first witness was Jan Huss, who freed the saints from the hands of the beast, after “time, times and half a time.” In 1471, the Moravian Church broke free from the power of the Papacy. Jan Huss was burned at the stake. 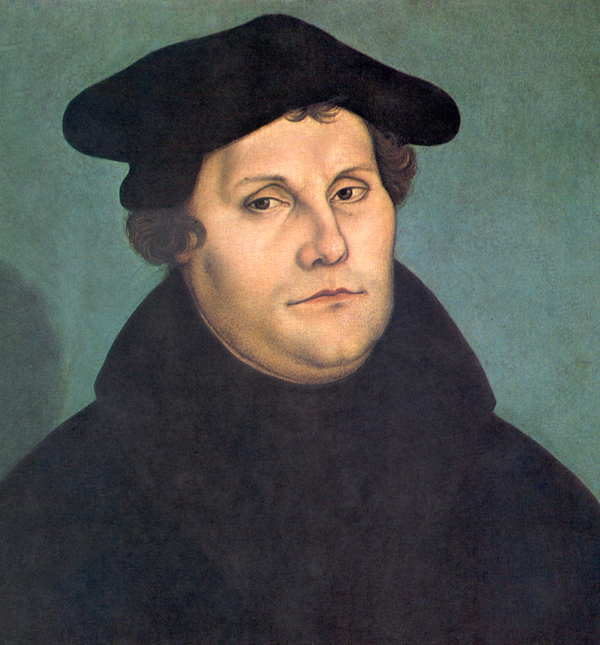 The second was Martin Luther, who “45 days” later appeared to start his Reformation, which, according to the Lutheran Church began in 1516 AD. 1 A reed like a rod was given to me. One said, “Rise, and measure God’s temple, and the altar, and those who worship in it. there was given to me a measuring rod – this brings us back to Ezekiel 40:3, and the vision of a man with the appearance of bronze, having a measuring rod to measure the temple. The measurements, from Ezekiel 43:1, are the boundaries of the sanctified Church. The measurements are the Gospel of Jesus Christ that allows “the glory of God to come in,” Ezek 43:2.
measure the temple of God and the altar – here John measures the sanctified Church, the true Church according to the measurements of Gospel of Christ, and counts those who are true. 2 Leave out the court which is outside of the temple, and don’t measure it, for it has been given to the gentiles. They will tread the holy city under foot for forty-two months. leave out the court which is outside – the Gentiles or Nations, were confined to the outer court under the Old Covenant, and John is told that they will also be excluded from the New Covenant grace. they will tread the Holy City underfoot for 42 months – the Gentiles trampled the Gospel for 42 months, which are 1278 days, 1278 years, from 193 AD until 1471 AD, when the first Protestant Church broke free from the Papacy. 3 I will give power to my two witnesses, and they will prophesy one thousand two hundred sixty days, clothed in sackcloth. And I will give power to My two witnesses – the word power, or authority, is not in the original text. The two witnesses, like the beast and the false prophet, are not “real persons.” However, they are represented by real persons. The Two Witnesses represent the faithful saints who prepare to protest against the beast, and can be particularly identified as Jan Huss and Martin Luther (blessed is he who waits and comes to 1335 days, Dan 12:12). These are the two great spokesman who liberated the saints from the power of the beast. they will prophesy 1260 days – this is the 42 months as “days.” The prophets are the saints who recognized the false teachings of the beast over this period, for example, the Waldenses and Albigenses, from 1175 to 1180 AD. “From Constantine to Hildebrand, from the third to eleventh centuries…Every country in Europe swelled with dissidents who repelled as the Antichrist the Bishop of Rome.” 1)1. Historical Studies, Eugene Lawrence, 1876, pp. 202.
in sackcloth – sackcloth in the Bible is a sign of personal or national disaster, described in verse 2, the saints have been “tread underfoot” by the nations. 4These are the two olive trees and the two lampstands, standing before the Lord of the earth. the two olive trees – see Zechariah 4:3,11-14, the anointed ones, meaning the saints, who are represented by Jan Huss, and Martin Luther. and the two lampstands – the Moravian and Lutheran churches. Jesus equated lampstands to churches in Revelation 1:20. 5 If anyone desires to harm them, fire proceeds out of their mouth and devours their enemies. If anyone desires to harm them, he must be killed in this way. fire comes out of their mouths – to preach the truth, and to protest. They speak the word of God, “is not My word as fire” (Jeremiah 23:29). If anyone wants to harm them, he must be killed in this way – by the word of God, which will devour him; “I am making My words in your mouth fire, and this people wood, it will consume them” (Jeremiah 5:14). 6 These have the power to shut up the sky, that it may not rain during the days of their prophecy. They have power over the waters, to turn them into blood, and to strike the earth with every plague, as often as they desire. power to shut up the sky – literally “heaven” as it bears the meaning of “heaven” in Revelation 10:5,6, etc. The two witnesses are “the anointed ones” (Zechariah 4:14), who have been “anointed” by the Spirit of Christ. They have the keys to the kingdom of heaven. They have the power to bring forth the spiritual rain of the Spirit of Christ, the “Rock” that strikes the “statue,” of the beast (Daniel 2:35). These are also great men of faith, like Elijah, “who prayed earnestly that it would not rain…then he prayed again, and the sky produced rain,” (James 5:17, 18, and 1 Kings 17:1). turn the water into blood and strike the earth with a plague – as the beast has been exposed by their preaching, baptism into the kingdom of the beast now result in spiritual death. (This metaphor is also used in Revelation 8:8, 16:3, to describe the spiritual deaths of those who are not baptised in the end time Sanctified Church.) The kingdom of the beast has been struck with its first plague. 7 When they have finished their testimony, the beast that comes up out of the abyss will make war with them, and overcome them, and kill them. the beast…will kill them – most notably Jan Huss, the founder of the Moravian Church, and the Moravian saints who formed the first Protestant Church. Jan Huss was burned at the stake, in 1415 AD, for his opposition to Catholic theology. The Moravian Church brothers were slaughtered in the forest, from 1468 until 1471 AD. See notes at Daniel 12:5-13, for more detail. 8 Their dead bodies will be in the street of the great city, which spiritually is called Sodom and Egypt, where also their Lord was crucified. the Great City – their bodies are figuratively murdered by the Great City of Mystery Babylon, the Great Harlot, which is Sodom and Egypt, the place of sin and captivity. 9 From among the peoples, tribes, languages, and nations will people look at their dead bodies for three and a half days, and will not allow their dead bodies to be laid in a tomb. 10 Those who dwell on the earth will rejoice over them, and make merry. They will send gifts to one another, because these two prophets tormented those who dwell on the earth. 11 After the three and a half days, the breath of life from God entered into them, and they stood on their feet. Great fear fell on those who saw them. those from the nations…– the Nations or Gentiles throughout the Book of Revelation, most notably in Revelation 19:represent those who are not the true saints, not belonging to “New Jerusalem.” The “nations” and “those who dwell on the earth” have the same meaning in this verse, as we shall see. those who dwell on the earth will rejoice – “those who dwell on the earth” has the same meaning as Revelation 13:8, “all those who dwell on the earth will worship (the beast).” The worshippers of the beast rejoice, believing that the Reformation has been stopped. they will send gifts to one another – those who worship the beast rejoice, such that they even send gifts to one another. Such behaviour was common among the Papists. Pope Alexander VI (1492 – 1503), apparently sent a gift of four mule loads of silver in order to secure his position as Pope in 1492. It is doubtless that the Papists sent gifts to one another to secure the fate of the Protestant reformers who opposed the Papacy. 12 I heard a loud voice from heaven saying to them, “Come up here!” They went up into heaven in the cloud, and their enemies saw them. and their enemies watched them (ascend to heaven) – symbolically the whole persecution and massacre of the Reformists became a public event where the Martyrs willingly accepted God’s call up to heaven, into the First Resurrection described in Rev 20:4. 13 In that hour there was a great earthquake, and a tenth of the city fell. Seven thousand people were killed in the earthquake, and the rest were terrified, and gave glory to the God of heaven. a tenth of the city fell – those of the “Great City” who died. The estimate of the deaths in this period range from 6 to 18 million; being one tenth of the 80 million people in Europe in 1600 AD. seven thousand were killed – see 1 Kings 19:18, “the knee who did not bow to Baal” that is the saints “in the wilderness” Rev 12:14, who did not “worship the beast” – the comparison is with Elijah in verse 6. These seven thousand represent the faithful matyrs. 1. ￪ 1. Historical Studies, Eugene Lawrence, 1876, pp. 202. 19. What if you see the Son of Man ascend to where He was before? Appendix 5 - The Spirit and the Holy Spirit, which One is it? 12. Who was manifest in the flesh? 18. A Third Person is "born"
The Lord’s Day, and when did Jesus rise?